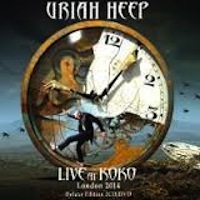 Born in the 1980s in England’s capitol of London, URIAH HEEP has been making music for decades and they are still at it, bigger and better than ever. When they hit their 40-year anniversary, they released an aptly named album, “Celebration”, which is a compilation of their greatest hits, re-recorded. After recording their last full-length release, “Into The Wild” in 2011, the band went back on the road for a world tour. These guys played in 58 different countries before returning to their hometown, where they played a live show that was recorded in HD for release as a double CD/DVD. “Live at Koko, London 2014” is this double CD release. CD one comes in at ten tracks with 50 minutes of listening time, while CD two comes in at eight tracks with about 40 minutes of listening time. CD one starts with “Against All Odds”. The track is the epitome of what Classic Rock stands for. It has killer guitars riffs, lightly employed bass, drums that make you want to dance, and vocals that are brilliant. The album seamlessly moves onto the next track with a bit of a “hello” from the band in between, because we all know we cant go to a live show and have no crowd interaction. In fact, most of the album, both one and two, flow nicely. When I am listening to a live album, I like to feel like I was sitting in the crowd. “Live at Koko, London 2014” is that album for the most part. There are parts where crowd interaction seems cut short. Not ever being at one of their live shows, these areas could be legit and they were ready to just rock. On CD one, some of the best tracks included “Sunrise”, “Stealin’”, “Can’t Take That Away” and “One Minute”. All are honorable in their own ways. “Sunrise” was a heavy vocal track, and I love vocals that sound the same live and recorded. This track showed that either live or recorded, they can sing. “Stealin’” is remarkable because this track was recorded in 1973 and still has the energy it did 40 years ago. “Can’t Take That Away” is honorable because this one reminds me of the time when Classic Rock and Metal melded together, bringing a bit a new sound to the times, as music changes through decades. “One Minute” is beautiful, as it starts a ballad, which presents the band in a soft manner, but becomes harder about a minute and 45 seconds in, giving definition to the track. On CD two, the transition is glorious from “Nail On The Head” to “Into The Wild”. “Into The Wild” is a great track. The keys and the drums kill the opening portion. The bass is also a bit more prominent. Of course, another of the best is “Gypsy”. The intro is perfect. The mix of the keys and guitars creates a unique sound. “July Morning”, another of the greats, is caught on CD two. The keys and guitars again, just completely take this track to another level. However, I think as a whole, this track is the best. Everything flows so well and the vocals are perfect. URIAH HEEP has survived for 40 years. If you can’t appreciate that, what can you? Not many musicians can do this. Not just do it, but continuously release albums through those years. The album is great. You get the best of the old and the new, the best of the 1970s through 2000s. Classic Heavy Rock is engrossed so much in this album. If you like it, you’ll love this album. Check it out.